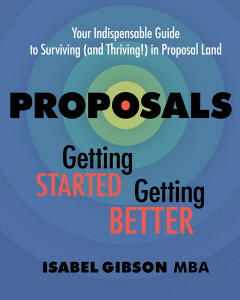 Isabel’s book passes along lessons learned about surviving—even thriving—while responding to RFPs. It is a comprehensive manual for those new to proposals as well as a guide for those who know the environment and want to do better—by their companies and by their people. RFP issuers routinely ask for twice as much information as can reasonably be gathered and presented in the time allowed. Many RFP responders use a cannon-fodder approach to proposal teams, throwing people at the mountain of work with little direction as to what matters and what doesn’t. Many proposal managers are first-timers, chosen for their technical/business expertise rather than their process management or marketing knowledge. Companies can’t change the stakes or get more time than other bidders. But they can – and should – fix the one thing they can control: They can be sure their proposal teams are prepared. Each task description is fleshed out with useful tips, many illustrated with anecdotes from 25 years in responding to RFPs and helping proposal teams win contracts.